A 96-page magazine featuring the front cover by Staff Artist, Erin McKee. Also includes 36-page City State installment titled "The Black Ring" by Dan Hauffe as part of the magazine. An interview with Dave Arneson, talks about his involvement in gaming and his start in role-playing. Lewis Pulsipher offers guidelines to Hearing, using ESP, and Pets that NPCs may have in his "Judges Tables". Alex Muromcew examines Thieves' Guild in "The Emperor's Counsel". "Armageddon" by Michael D. Reugh and "The Melee Round" by David Malpass are the fiction offerings this time. In "Things You See in the Wilderness", Paul Elkman gives fellow Judges tips on creating tables to fill up a barren wilderness. Dave Arneson sets up the effects, spread and duration of a number of sicknesses in "Diseases". Our second dungeon is titled "The Forgotten Mine" written by Dan Goodsell. Morgan O. Woodward III presents an interesting variant to role-playing with his "Hit Point System". New and unusual magic items are showcased in "All That Glitters" with all manner of magical and mundane beasts will appear in "... And Things That Go Bump in the Night". New products such as Duel Arcane by Gamelords Ltd and Knights and Magick by Heritage are reviewed in this issue. A 96-page magazine with a front cover by Erin McKee. This month's interview is with Bob Bledsaw, Founder and Vice-President of the Judges Guild. Tom Zarbock presents a parts inventory to a magical artifact in his "ABC's of a Wand of Cold". Describing magic items is made easier with "You Find a Vial of Green Chunky Liquid... or What Does Your Treasure Look Like?" by Michael Callihan. Thomas A McCloud discusses the use of 3"x5" filing cards to describe magic items in "Magic Item Cards". Fiction in this issue comes in the form of "Quest Beneath Roglaroon" by R.K.Work and "God Tongue" by James Newsome. "The Emperor's Councel" presents a varient magic system by Germain Giner. Rudy Kraft presents new "Treasures of Runequest", while adventure abounds in "The Tomb of Kixandran" by Rusty Lamont. This time the 36 page City State Campaign installment has ben written by Scott Fulton and takes us to "Revelshire". Ken St.Andre, creator of Tunnels and Trolls offers guidelines on setting up "T&T Armies". As usual, "All that Glitters..." is well stocked with a variety of unique and unusual treasures, as is "...And Things That Go Bump in the Night", and its menagerie of new and malignant creatures. "Gemstones and Their Powers" by Alfred Donovan and Soloman Rahlook TiAu'ssya discusses the appearance and abilities of Stones usually taken for granted. "The Wizard Sword" by David Dougher describes the powers and construction of a mighty weapon useable by the powerful Wizards of a game. A 96-page magazine with front cover by Ken Simpson. An interview with Dave Sering, one of the senior designers at Judgs Guild, is included this month. Paul jaquays presents an expansion of Deathdrake Temple from Duck Tower. Charts to make the Judge's job easier abound in "Physical Descriptions" by Tom Jones, which tells how to describe nearly any given NPS with several rolls of the dice, and "Wanderer's Merchant Company" by David Mackenzie, which details the intracacies of buying and selling goods in a fantasy role-playing game and includes a Standard Cost and Measures Chart. This issue's 36-page installment to the City-State Campaign is "Isle of the Blest", by Scott Fulton. A complete description of adventuring with the Sea Mages of Goeldralf is included in the article, "Sea Mages" by Paul Elkman, and the use of catapults from land or sea is detailed in "Catapult Warfare" by Keith Bradsher. Tom Holsinger gives us an interesting Traveller variant including some necessary ship design revisions in "Traveller Combat Revisions", and Paul Andres Denisowski details encounters of the roads of fantasy in "Wilderness Roads". Also included is a Skulls and Crossbones Adventure entitled "The Adventure of Yardarm McGraw's Treasure" by Gerald Seppana. Chuck Anshell takes us on a mini-trip through new columns and articles in "Horse Feathers", and Clayton Miner presents scintilliating reviews of Arduin Adventure and Swashbuckler. All in all, it's a great issue that you won't want to be without! A 96-page magazine featuring the front cover by Staff Artist, Rick Houser. Also includes an eight page dissertation on "Monotheism in Fantasy Games" by Joseph R.Ravitts. To alleviate those incongruities of melee combat, we present Perry T.Cooper's article, "A Realistic System for Handling Missile Weapon Combat", Ross E.Mosteller's "The Hit Location Chart", and Emil Parker's "But, Mr.DM, It Wouldn't Take Someone With Two Broken Arms 60 Seconds to Draw a Dagger". Dungeon humor continues with Bill Paley's fifth installment of "A Trip to the Underworld". Fiction in this issue includes Patricia Hockhalter's "Curse of the Green Lock Forest" and Michael S. Quesenberry's "With Nations Underfoot". To help you play specific classes, we have Paul Andres Denisowski's "Clerial Spell Attack" and Mark Schumann's "Making the Most of the Fighter Character". Then there's the "Character Code" by Michael S.Quesenberry, "Oh My Gawd, I Can't See" by Tim Grice, "Crime in D&D" by Adam Griffith, and the first of a continuing feature, "Hanging Out in the City-State" by Edward R.G.Mortimer. 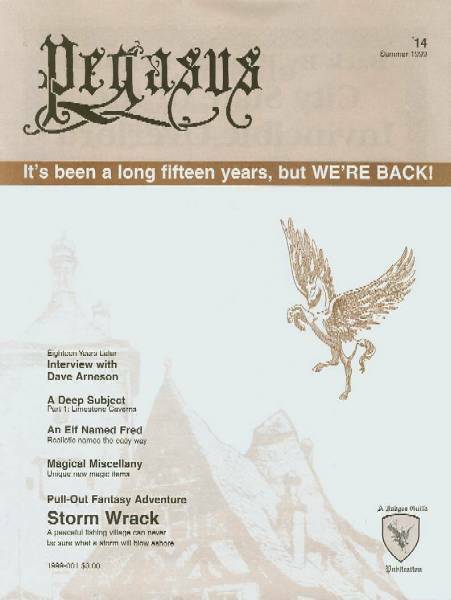 Adventures in this issue include our regular Guildmember Installment, this issue entitled "Isle of Tirnanog", and Stefan Jones's daring Tunnels and Trolls adventure, "Mountain Moor". Aaron Arocho presents us with a three-page comic, "Questing", and as usual, we present you with "Things That Go Bump in the Night". A 96-pag magazine featuring a front cover by Aaron Arocho. This issue includes the first installments of four new columns, "Gateway Quadrant" by Dave Sering, "Morrow Project Report" by Bill Pixley, and "Screen Scens' and "magik Tomes" by C.J.Henderson. "The Vile File" by Will Faust also begins this issue, and the second "Hanging Out in the CityState" by edward R.G.Mortimer, features a party at the Slave Master's Guild. William Hamblin presents a short history lesson in "The Origin of the Black Arts". Gerald Seypura gives us another Skull and Crossbones scenario, "Adventure of the Devil's Luck". Sea adventures continue in this issue's Guildmember Installment, "The Quest for the Silver Empress" by Clayton Miner and with an enchanting poem by Diane Mortimer and 13 entitled, "Mermaid Memories". Roy Cram further details the effects of magical potions in "Potions Perilous". the Christmas adventure is a whimsical piece, "Te Saving of Kris Kringle" by Bart Hughes. The question of Christianity and FRP is further explored n Dr.Robert M.Price's article, "The Crusade Against Fantasy Role Playing". Fiction ni this issue includes the last of Bill Paley's "A Trip to the Underworld" and Edward M.Vaughn's intriguing tail, "Triple Entente". As usual , we present you with "A Stroll Through the Marketplace" by 13 and Joseph Weingand, "Convention Compendium", "All That Glitters", and "... and Things That Go Bump in the Night". A 96-page magazine featuring a front cover by Staff Artist, Rick Houser. 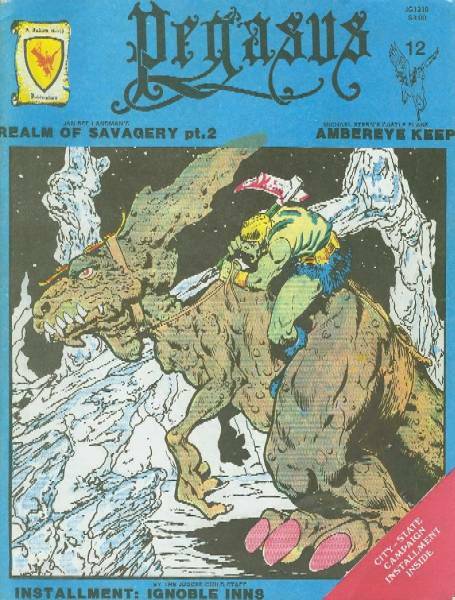 This issue features David F.Naile's Ysgarth adventure, "Blood Tribute" and fine artwork by Russ Steffens and Mel White. "From the Horse's Mouth" returns with three computer game reviews by Rob Greenberg. The regular columns continue with "Hanging Out in the City-State", by Edward R.G.Mortimer, "Morrow Project Report" by Bill Pixley, "Gateway Quadrant" by Dave Sering, "The Vile File" by Will Faust, "Screen Scenes" by C.J.Henderson, and "Magik Tomes" by Debye Pruitt and C.J.Henderson. Paul Elkmann gives us a variant chess game, "Rules for Kaissa: Gorean Chess". Two mini-adventures, "The Jackrabbits' Lair", a Bunnies and Burrows scenario by Daniel J.Maxfield, and "The Goblin Caves" a TFT scenario by Dan Goodsell are included. The Guildmember installment features the stronghold of river pirates in Tarantis and is entitled "The Azurerian Pirates" and written by R.J.Baier. A new Traveller ship is constructed by Stefan Jones in "Beastmaster Safari Ship". An article on how to tell Pirates apart when on the high seas is presented by John Mortimer in "Showing Your True Colors". Ocean Merchants are detailed in "Sea Trade guidelines" by Tom Jones. A comprehensive listing of magic spells is presented by Joseph O.Alford in "An index to Arduin Grimoire Magik" and Mike Tarkington gives us an easy system for hunting for food in an FRP setting in "I'm Starving". In addition, we again bring you "A Stroll Through the Marketplace" by 13 and Joseph Weingand, and the ever-popular "Convention Compendium". A 96-page magazine featuring a front cover by outstanding artist, Russ Steffens. Once again, we bring you "Haning Out in the City-State" by Edwared R.G.Mortimer, "The Vile File" by Will Faust, "Gateway Quadrant" by Dave Sering, "Morrow Project Report" by Bill Pixley, and "Screen Scenes" and "Magik Tomes" by C.J.Henderson. The debate on Christianity and fantasy role playing rages n with Anthony Breaux's "Presence or Absence of Christianity in FRP" and in a growing deluge of reader's letters, some of which have been reproduced in "The Town Crier" Bill Pixley gives us a review of Beasts, Men, and Gods in "From the Horse's Mouth". Adventures in this issue include a trio of Villian and vigilantes scenarios by Paul Ryan O'Connor, collectively entitled, "Enemies of Justice" and a solitaire adventure for Tunnels and Trolls by Roy Cram, titled "The Old Dwarf Mine". The Guildmember installment features four mini-scenarios which can be used seperately of can be interconnected. We have "Aeiel's Tutoring Service" by Charles Farnum, "Kthenta's Dark Repose" by Conrad Heiney, "The Runied Tower of Mabeleck" by Bill Prouty, and "The Pyramid of Suberus" by Gregg Woodcock and Christopher Weaver. Several articles are presented that deal with helping the Judge run his or her campaign, including" How to Raise Pet Dragons" by Thomas A.McCloud, "Accurate Critical Hits" by Paul Andrew Denisowski, "Make Your Cities Come Alive" by Daniel J. Henley, "Written Languages" by Mike Horn, and a well-thought-out treatise on "Standardization in Fantasy Role-Playing" by Bob Bledsaw. Our fiction includes the first of a two-part adventure by C.J.Henderson titled "To The Beast"which will have you aching to hear the rest of the story and is adroitly illustrated by Russ Steffens. The Legion Strikes - A Champion scenario which includes a 3 level laboratory and has 12 pages of description. Also featured are two fantasy fiction stories: A Winter Stroll and Call Him Lucky. For Tunnels & Trolls fans we have The Tower of Cailif. The City State Campaign Installment is Revenge of the Ant God by Bob Bledsaw. This 32 page installment includes 4 11x17" map sections which can be easily pulled out from the middle of the book and 17 pages of descriptive text and tables for use in your fantasy campaign. Also, the Pegasus is full of our regular columns such as Hanging Out in the City State, Stroll Through the Marketplace, and All That Glitters, which featuers new magic items for any FPR system.